The Ironbridge Gorge was the innovative center for iron making during the First Industrial Revolution in England. In 1709 iron production became serious here after Abraham Darby I started using the plentiful coke instead of more costly charcoal to fuel his furnace to produce iron. Subsequently, iron, tiles and porcelain were made here on an industrial scale. The gorge takes its name from its famous Iron Bridge, the first iron bridge of its kind in the world. The bridge was built in 1779 to link the industrial town of Broseley with the smaller mining town of Madeley and the growing industrial centre of Coalbrookdale. The deep gorge was formed by the river Severn in Shropshire. The area was rich in raw materials, and the river made transport easy. 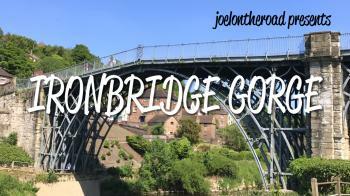 I visited the Ironbridge Gorge on a day trip from Llangollen, just over the border in Wales. My rental Ford Focus got me there via narrow, winding roads just before 10 a.m.. I was early enough to get a parking spot in the center of Ironbridge town. I had printed out a hiking map beforehand (the South Telford Heritage Trail), and set out on foot to at least walk part of it. The main focus at first is the Iron Bridge itself. It’s an imposing structure for its age, and pretty photogenic too. I crossed it, and walked on the other side of the river Severn to Jackfield and Coalport. The walking trail here lies between the river and the main road, but the shrubs are too thick to see anything worthwhile. It is actually just the sort of path you see at BBC Crimewatch when someone is suddenly attacked by a stranger. Fortunately nothing happened to me, I only encountered some fellow hikers. The path ends near the former tile factories of Jackfield, and then I crossed the river again via the footbridge. This is where the Tar Tunnel lies, and also the Hay Inclined Plane (a lift or funicular for ships). Only the tracks remain. 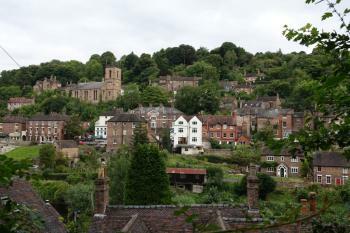 I walked back along the main road to Ironbridge. After my walk, I tried two of the Ironbridge Gorge museums. You can visit all 10 of them for a rather steep 22.5 pounds (they’re not exactly the Uffizi or the Hermitage so I think that is a lot of money). The Ironbridge Museum’s main feature is a 10 minute video that shows the basic history of the area. The Iron Museum in Coalbrookdale is a larger complex, with an indoor exhibition and outdoor structures like the Old Furnace. Both museums failed to inspire me, they are pretty much a collection of display boards and parafernalia. The Ironbridge museums have won the European Museum of the Year award in 1977, but are not up to what a museum can be in 2011. Earlier this summer I visited the Gallo-Roman Museum in Tongres (Belgium) and the Laténium in Neuchatel (Switzerland), where much better presentations are made out of much less history. As will be clear by now, I was quite disappointed with Ironbridge though I like industrial heritage in general. It's more the age of things that is remarkable here, than the physical remains. The little towns hold some very pretty cottages, and the river Severn now flows peacefully through this green landscape where nature has taken over again from heavy industry. 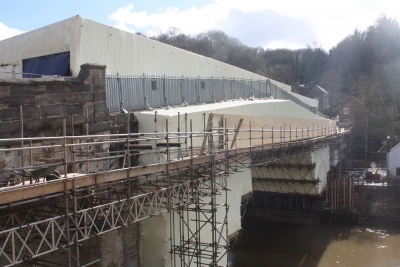 March 2018 - Oh no, we arrived in Ironbridge, but the main attraction was under renovation and wrapped in white sheets. What a pitty! Anyway we took a walk to both sides of the bridge and tried to get a glance of the historic sites of the gorge. We had pastries, fish and chips, and there was a nice shop with a tremendous selection of gin and beer. Hay Brook Valley we did not want to visit, due to time constraints and due to the high prize. By car we drove further up the valley to see some more factories and finally left the WHS again. I guess we could have seen more and reap more from the visit. But without the bridge the experience was anyway just moderate. When I stepped off the bus in Ironbridge and got my first glimpse of the bridge I was already smitten. It’s a picturesque site, embedded in a lovely river valley with the usual English countryside charm. Little points to this having been a key site in UK’s industrial revolution. Prior to the industrial revolution the iron ore was melted using charcoal. In my line of work we would call that biomass and consider it CO2 neutral, i.e. pretty great. But charcoal was tied to sustainable (then phew!) forestry and this severely limited the volume of ore you could melt. So you couldn’t actually leverage larger production sites. Only when the switch to coal and better yet coke occurred was real growth possible. 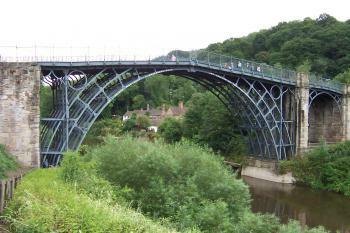 The area around Ironbridge, already a center for iron production since medieval times, offered both iron and coal and grew rapidly as a consequence. While this is yet another of UK’s industrial sites, I had a pleasant time and I think this is a valuable site. Due to this being on the forefront of industrialization the buildings seem to have fallen out of time compared to a later industrialization site such as Völklinger Hütte. But well, with the furnaces in operation and the chimneys blowing out huge smoke clouds day and night, the area probably looked far less idyllic. From Monday to Saturday there are regular busses connecting Telford to Ironbridge. They do not run via the train station. From the train station you have to walk to the nearby shopping center and head for the well signposted bus station on the other side of it. Right now the buses depart from Gate S (rightmost, outside), but construction work is ongoing, so this may change. There are two different bus routes: a western one via Coalbrookdale and an eastern one via Madeley. Bring some change as they seem to be running low on coins. One way cost is around 2.60 GBP. There are also shuttle buses. Some regularly connect the P&R parking lots to the sites. Half hourly shuttle buses run between Madeley and Coalbrookdale with stops at all the main sites. They run only on weekends and holidays. If you plan to visit on a Sunday or a holiday and are depending on public transport, your best option seems to be to go to Madeley and take the shuttle bus. Instead of the shuttle bus you can always walk. Several nice hiking trails are set up and connect the sites. My recommendation would be to start on one side of the site (Madeley or Coalbrookdale) and then traverse it. From Telford Station you can travel westwards to Snowdonia and Bangor. Or eastwards to Birmingham with its airport. Be advised that tickets are only sold on the Eastbound (opposite) side of the station. This nearly made me miss my connection. Fortunately, the train was running late. The Pontcysyllte Aqueduct and the Gwynedd Castles are connected by the same rail line from Telford. The aqueduct is a nice addition to this site and both can be done handily in one day from Birmingham. The area houses a surprising number of museums that shed some light on different aspects of the site (tiles, china, iron, ...). Prices are (typical for the UK) rather high. A day pass for all museums costs 25 GBP, a single museum 9 GBP. I went to the Iron Museum and found the presentation rather useful to make sense of the site. The building itself is also interesting and you can see the furnace that started the region’s boom. Those parts are free. The Blists Hill Victorian Town is an open air museum that seemed rather popular with visitors. If you plan to go here, buy the combined ticket as it by itself already comes in at 19 GBP. I wasn’t into it and preferred hiking back to Ironbridge. A unique way to experience the site is to kayak along the Severn river and beneath the bridge. There seem to be multiple operators. I only spotted this one in town. During my visit I noticed a group of volunteers cutting brushes along the riverbank. I think it’s great sign for the value of the site in the community and I found this highly commendable. On instagram Ian recommended trying the pork pie. I guess he was referring to Eleys (Self Acclaimed) World Famous Pork Pies. Luckily, I am not a lunch person anyhow, so it doesn’t feel as too much of miss, seeing he provided his recommendation after the visit. If you are more of lunch person, the place seems to be just across the road from the bridge. I visited this site with my wife in June 2017. We had a rental car and so were able to drive directly to the village itself. The bridge is quite impressive, though a bit smaller than I expected. Very beautifully constructed though, and the way the paths run around the gorge you can see it from most angles. Overall it's an interesting site, but fairly typical of the UK Industrial Revolution sites. Not somewhere I'd particularly recommend going out of your way for, but a diversion to see the bridge is well worth it. 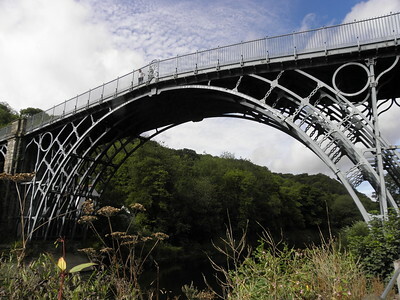 When I was planning a trip to Wales in 2005, I realized I would be traveling very close to Ironbridge Gorge, widely recognized as the birthplace of the Industrial Revolution. With my interest in world history, there was no way I could bypass this site, so I arranged for a day trip detour. The Severn River flows through the gorge, which is named for the famed Iron Bridge detailed in other reviews. I enjoyed walking over this remarkable piece of engineering, as well as viewing it from the trails on both banks of the river. Just as fascinating was the Blists Hill open-air museum, which included examples of the coal and iron mines involved in making this valley so important to the Industrial Revolution. In the early 18th century, Abraham Darby used coke, derived from coal, to fuel blast furnaces along the gorge. This created a less expensive source of cast iron and revolutionized the iron-making industry. Blast furnaces from the Madeley Wood Company are still on display at Blists Hill, and I was impressed by their conservation. 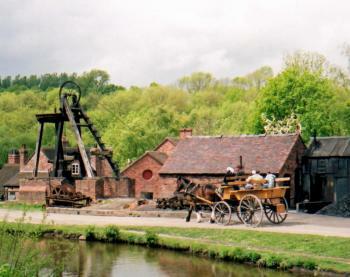 Blists Hill also offers examples of a Victorian-era town, which I enjoyed exploring. I highly recommend this site for anyone with any interest in technological innovations in world history. multiple museums. There is also a train station at Telford, to the north of the gorge. I visited this WHS in June 2016. Arriving from South Wales by car, I drove through several rural roads to get to Ironbrige. I parked at the pay and display car park next to the Ironbridge Gorge Museum (worth visiting) which is just a short walk away from the symbol of Industrial Revolution. Although there is a National Heritage sign just in front of the bridge, hidden just behind it in a corner with a dustbin strapped to the railings in front of it (not impressed at all!!!) was the official UNESCO plaque. Just a small trivia; apparently in 1987, the UK company in charge of producing the UNESCO plaques for the UK WH sites inscribed in 1986, made a mistake and all these signs have the same mistake "inscribed in 1987" or "1987" instead of 1986. In fact, the manager at Caernafon Castle in Wales (who told me about this!) removed the sign which is now hidden in the castle's multimedia room until new plaques arrive. Anyhow, apart from the several museums and a pleasant walk by the river just below the old tollhouse, there isn't much to entertain a longer visit. The village itself is very touristy and although I tried Eley's world famous hand raised pork pies (the small ones are more than enough! ), I very much preferred Eley's hot pastries which I ate on the bench just opposite while enjoying the view. Considering the link with Blaenavon's industrial heritage for example, I think it would have made much more sense in terms of OUV to have one WHS inscription in the UK linked to the industrial heritage of iron production which would include both sites. I visited Ironbridge with my grandparents in August 2013. Although there are something like 14 distinct things to see/museums in the vicinity, the eponymous Iron Bridge is the focal point. Whilst it isn’t particularly impressive when compared to modern bridges like Millau, at the time it was groundbreaking. 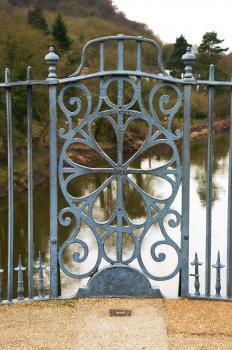 The bridge served two purposes: one, of course, was as a means of crossing the River Severn. This was an important thing for the town as it was at the epicentre of the early Industrial Revolution and was rapidly ramping up production of cast iron for export throughout the country and across the world. The second use of the bridge, however, was to serve as an audacious advert for the load-bearing properties of Shropshire steel. Anybody who didn’t believe the early claims of the steel barons had only to come to Ironbridge and see it himself. Elsewhere in the vicinity of Ironbridge there are museums such as Blists Hill Victorian Town Be warned – the museums are not free like in Blaenavon. It costs £8.25 to get into the China museum, for example, and a pass to all the museums is £24! The bridge is free, of course, and I satisfied myself by also visiting the Tar Tunnel (£3). This is a 3000 foot, 225 year old tunnel dug into the hillside by miners who struck natural bitumen. You can go about 50 metres into it, and see for yourself the tar oozing through the walls. When my taxi driver pointed me to see the famous Ironbridge, the symbol of the Industrial Revolution, I felt quite underwhelmed with the appearance of the bridge which was very different from my imagination. The bridge was located in the middle of a very touristy village with many shops and restaurants that far from my ideal industrial valley. It seemed to me that apart from the modern power plant, the industry legacy of this valley was indeed a history. After ate a piece of pork pie which claimed by owner to be the best in the world! It was time for me to see the bridge. I found that crossing the bridge was not quite a comfortable experience as the bridge was quite steep than normal pedestal bridge in the present time; however the view of the village and gorge as well as the details of the bridge decorations were quite lovely. The number of 1779, the year that the bridge was erected was stamped in the middle of the bridge railings showing its historical significance. All in all, a fine place to visit for 15-20 minutes! I decided not to visit any museum except the Ironbridge George Museum which had well stock of souvenirs. The friendly museum staff advised me how to go back to Telford where the nearest train station located. Two Korean tourists and I were very confused with two bus stops located in both side of the street in front of the bridge indicating that both directions can go to Telford! At the end I was able to reach Telford but have to change bus again in the town center. I have the pleasure of both working for the Ironbridge Gorge Museums and being a local resident, so I hope that you can accept my short review! Founded in 1967, the Ironbridge Gorge Museum Trust is a registered charity whose twin aims are education and heritage conservation. The Trust cares for 36 scheduled monuments and listed buildings within the Ironbridge Gorge World Heritage Site and operates 10 museums which collectively tell the story of the birthplace of the Industrial Revolution. These museums received 567,000 visits in 2010, including around 70,000 school visits. The largest of our sites is Blists Hill Victorian Town, which in 2009 saw the completion of a £12m development, supported by Advantage West Midlands and European Regional Development Funding. Following this generational investment, Blists Hill Victorian Town received 9 major regional and national awards including reaching the final of the Art Fund Prize for Museums & Galleries 2010, the largest arts prize in the United Kingdom. As well as 10 museums, the sites in the Trust’s care include a research library, a tourist information centre, two youth hostels, archaeological monuments, historic woodlands, housing, two chapels, and two Quaker burial grounds. 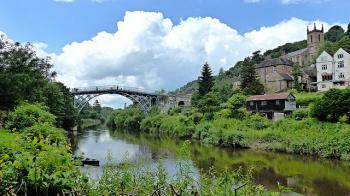 In 2011 Ironbridge celebrated its 25th anniversary as one of the UK's first World Heritage Sites. We hope that many people take the opportunity to discover the many charms of this beautiful and historic site for themselves. This was one of the original group of UK entries to the list, the site is essentially the birthplace of the Industrial Revolution. It was here that coke was first used on a large scale to produce iron, speeding up the process and making this town the industrial heart of the world for about a decade. The British list is quite heavy on Industrial heritage, and I think quite rightly so, as they are of massive global importance. The town itself now is an idyllic little town, which is kept immaculately without being too sterile. The centre of the town is on one side of the river Severn, which is crossed by the Ironbridge (pictured) this was the first bridge to be made of this material in the world. It is an impressive piece of engineering and is a fantastic symbol for this period of history. The site also includes neighbouring towns and their foundries, the most famous one is at Coalbrookedale and this is now a museum. The museum was nicely laid out, and if you want an introduction to the Iron making process then this is a great place to start. At the back of the forecourt are the remains of the first furnace to use coke, which I found to be a little more interesting than the museum itself. Overall there are about 10 different museums in the area and you could easily spend a full day here going from one to the other. The distance to some of the museums can slow down progress unless you have your own transport, but there were a few buses running around. 163 Community Members have visited.